Days like this is what the job is all about. 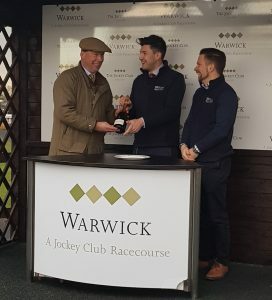 We have sponsored several races over the past few years at Worcester Racecourse, but 25th January saw our first sponsorship at the very hospitable Warwick! It was also the first time we donned our HM Equine Gillet’s, supplied by the wonderful Will at Wreal Sports in Bourton-on-the-Water. 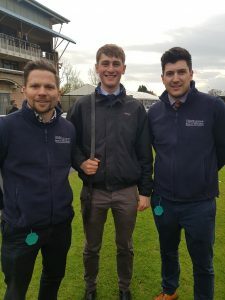 Will supplies some of our clients and other trainers and business’, we couldn’t be happier with the work he did for us, as well as how quickly he turned them around. We started our day in the Owners and Trainers Bar, where we had our HM Banner and Brochures available to look at. After a few coffee’s (and a few bets) it was nearly time for our race. Luckily the weather held out and we stayed dry, and a few winners had by some of the HM staff. 3.45, and we hit the parade ring to pick the Best Turned Out Horse. The decision was completely unanimous and we chose Zac Baker with ‘Granard’ trained by Nigel Twiston-Davies. Congratulations Zac, great effort and well deserved. Our client Fergal O’Brien obviously wanted to be part of the action, and casually jumped in the photo. It was an absolute Honor to present the winning bottle to our Client Henry Daly with his horse ‘Stoney Mountain’. 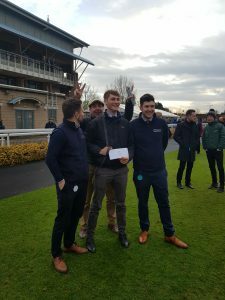 All in All a great day was had by everyone, thank you to the Warwick Racecourse Staff for being so hospitable and making the day run so smoothly. 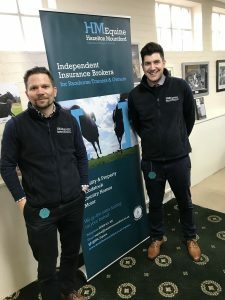 HM Equine will be the proud Sponsors of the ‘Owners and Trainers Bar’ at Worcester Racecourse starting in May, kicking off the Summer Jump Season. We are also sponsoring ‘The Trainers Championship’.